Apollo would be pleased to know how much I love taking pictures of sunflowers. Yes, the Sun God is more or less responsible for these cheerful floral beauties! iPhoneography, sunflower taken with my iPhone 5s. I used the Hydra app to capture it in HDR. Then it's further edited in Perfect Effects where it gets a lovely glow and a frame. A water nymph named Cytlia adored him... and you know how young girls in love can be. Well, she couldn't stop staring at Apollo even though he hardly knew she existed. Ah, poor girl. Some of the other Gods felt really bad for her... so bad, in fact, they turned her into a magnificent sunflower. And, even today, she gazes lovingly at Apollo when he shines down on Earth. These golden beauties worship the rays so much, their petals turn and follow the sun from east to west every day... just like Cytlia. At night, they lean back to the east and wait for the sun to peak over the horizon... when they fixate on it again. The older blooms get a bit lazy. Must take too much energy to hold up their heavy heads. Like most seniors, they don't move around as well as they used to. But, wait for the sun to go behind light clouds so your picture doesn't have ugly white skies or black shadows. If direct sun is reflecting off the petals, you'll lose detail in the dark centre. That's because a camera can't work with so many levels of light that your eyes see... so light cloud cover reduces that range. With less range of brightness, you can get much more detail n your photo. A very dull day won't bring out the vibrant yellow, orange and reds. But right after a rain, if it gets bright out... that' s a fabulous time. The colours absolutely sparkle! And raindrops on petals make for great photos. Early morning or evening when the sun is low in the sky, is an excellent time to photograph sunflowers. Early morning and evening light is in the warm colour temperature range. Warm colour temperatures will bring out the rich, warm shades of the sunflower. A miniature sunflower. A RAW file, into Camera Raw, Photoshop and then dressed up in several texture layers in On1. A dark and mysterious background. Have you ever seen Van Gogh's painting - the Sunflowers? It's one of the most popular pieces in the National Gallery in London. He liked pictures of sunflowers so much he painted 11 sunflower canvases. The yellow color was his personal symbol of happiness - I totally get that! Let's start out with hot coloured textures for a hot, sunny flower! 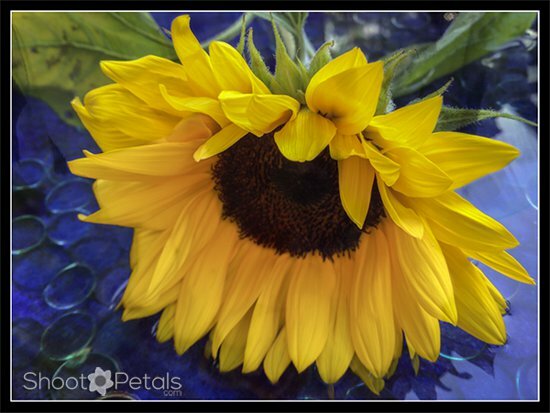 All this blazing color around the sunflower feels a lot like the rays of the sun... what these fabulous flowers symbolize! I usually lean towards subdued colors but the fiery red and yellow is perfect here ~ in both of these pictures of sunflowers . I used several texture layers, two of the red-yellow light... transparency about 80%. I wanted the Fibonacci spiral of all the tiny flowers and seeds to be visible, so I "brushed out" most of the texture over them. Copying Van Gogh... I hope he doesn't mind! Six layers of textures and experimenting with the transparency of each layer. Might not look like it, but this really is a photo. It's so cool what you can do in photo editing programs... express yourself! iPhoneography: iPhone 5s, Sunflower. The frame is very thin, black and only traces around the borders of the image. It doesn't take anything away from the photo. Give a lot of thought to how you frame your images. Try out as many as it takes until you feel "ah, that's it". You don't want to mess up a beautiful edited image with a poor framing job. The border shouldn't pull attention away from the image. It has to blend in and complement each particular photo. If your eye goes directly to the frame, scrap it! Give it another go. You might need to set it aside for a fresh start tomorrow. Once you know the technical side of your editor, the process is one of feelings and less of thinking. 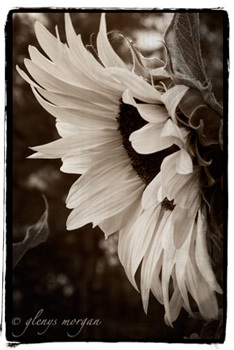 Sepia toned sunflower, very dark, graceful sunflower. Textures and framed On1. Sepia conversion in Photoshop. 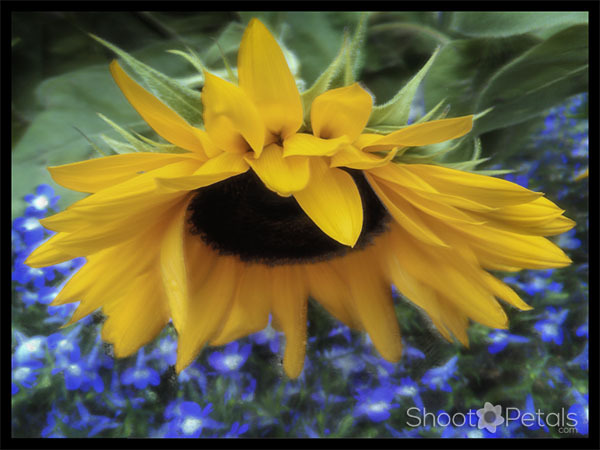 Picture of Sunflower with a Nikon macro 105 mm lens. See the pattern.that the small florets make.. a Fibonacci spiral. Amazing detail. Another close-up taken with my Nikon 105 mm macro lens. I was at VanDusen Botanical Garden. Sunflower heads are interesting. Each small 'seed' is from an individual flower and the head is made of hundreds of small flowers. Look closely the sunflower head. There's an interesting pattern and you can get creative in your pictures of sunflowers by getting close up... especially with a macro lens. Do you know anything about Fibonacci? Fibonacci numbers are named for a mathematician, Bonacci, who published his theories in 1202. Nature is full of the patterns that his ratios explain - including the sunflower seeds that grow in a spiral patterns outwards from the center. 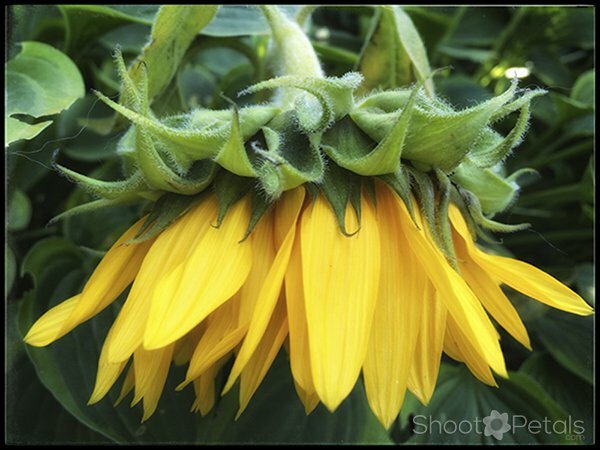 And you can learn much more about Fibonacci and getting creative pictures of sunflowers right here. Use the ratios and spiral to compose better photos... you'll get lots of hints on how to do that. There's no end to the sunflowers' uses... seedy treats for birds, agricultural crop and cheery flowers for bouquets! They're also great subjects for photos. Sunflowers are strong, vibrant flowers and a field sure perks up the surroundings. 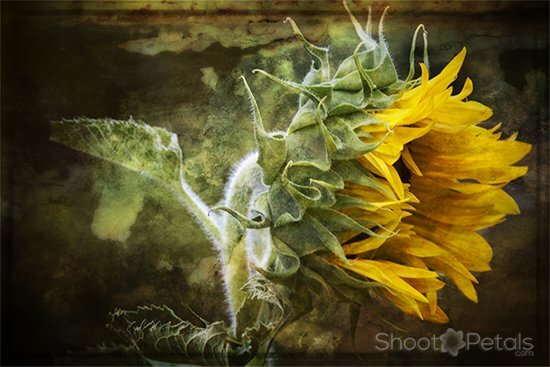 Always a good idea to get pictures of sunflowers with a hungry bird feasting on the flower's seeds, or a field of them blooming and ready for harvest. The miniatures make gorgeous bouquets... great for close-ups or your macro lens. Find out anything you ever wanted to know about sunflowers at the National Sunflower Association right here. There are still lots of wild sunflowers around right now - but there's a worrying review in the globalwarmingisreal blog about wildflowers. It makes me quite sad to read that they're falling victim to the effects of climate change. Studies of wildflowers in the Colorado Rocky Mountains show they're in danger. Earlier springs are encouraging plants to bloom earlier, then up to 75% of the buds are killed by spring frosts. For wildflower lovers and pollinating insects, that's not good news! 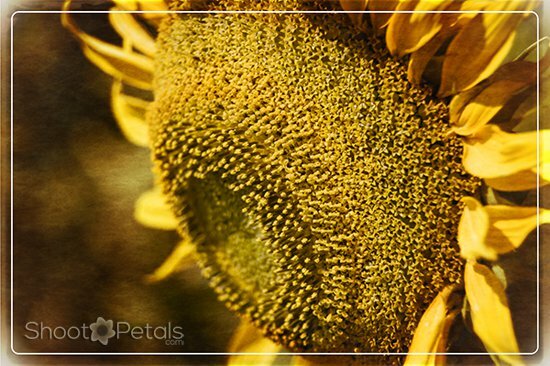 The wild sunflowers originated in Central America... Mexico, to be exact, way back in 2600 BC. And we STILL love them dearly! The Aztecs worshiped them as their Sun Gods. All the way across the ocean in Holland, they were a symbol of loyalty and devotion. Take a bunch of the pretty new miniatures to your mom, your wife or your girlfriend! Whatever way you achieve it, once you find your style, your photos will reflect who you are. They won't just be snapshots! Heck, you probably won't even recognize your photos a year from now! My photography and photo editing gets better and it gets easier to create the image I see in my imagination. It takes practice to improve your skills... a little bit every day. 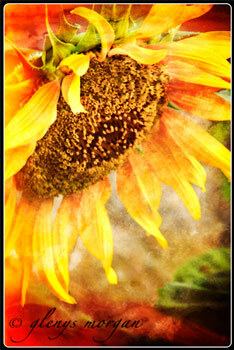 Editing these pictures of sunflowers was a blast! And I'm sharing them with you because I enjoy adding sunshine to your day. If I succeeded, please leave a note below or give my page a "like"... or both!